The Lighthouse of Alexandria is one of the greatest architectural feats of antiquity. It was at least as tall as a 40 story modern building and stood for over 16 centuries in Egypt. This Seven Wonder helped seafaring ships find the harbor and then safely enter it (treacherous shoals existed just outside the harbor). The lighthouse also served as a military lookout for approaching enemy ships. It was also a tourist destination (with two observation platforms). It was obviously solidly constructed. This Seven Wonder survived for some 1600 years despite being assaulted by fierce winter sea storms and many earthquakes. 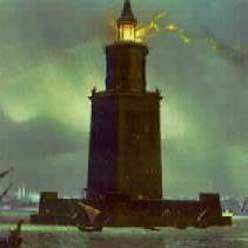 The Lighthouse of Alexandria employed two types of beacons placed near the building's summit. At night, a bonfire generated the light. During the day, a mirror created it by reflecting and directing sun rays. The mirror was probably a large, round, concave disc made of polished metal.